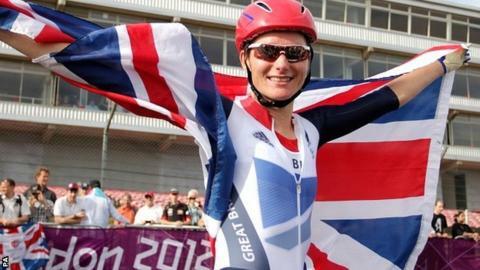 Sarah Storey equalled the British record for modern Paralympic victories as she routed the C4-5 road race field to secure her fourth London 2012 gold. The 34-year-old joins swimmer Dave Roberts and wheelchair racer Baroness Grey-Thompson in winning 11 titles. Storey, who had already won the road time trial, the 500m time trial and the individual pursuit earlier in the Games, seized control from the gun. She finished alone, over seven minutes ahead of Anna Harkowska. "New landmarks, at the heights of both disabled and non-disabled sport, may still await Storey in Rio." "The records are lovely things to talk about but each race is an achievement in its own, each is hard fought," she told BBC Radio 5 live. "Just being able to say that you have won for your country is a great honour." Storey - who is still five golds short of the 16 won by compatriot Mike Kenny before the start of the modern Paralympics - won her first medals as a 14-year-old swimmer at Barcelona 20 years ago. Since then she has won another four in the pool before switching to cycling in 2005 following a chronic ear infection that prevented her training in the water. Each of her three success in London has come by a considerable margin, but her fourth and final victory was perhaps the most emphatic. Fellow Briton Mark Cavendish believed his attempt to win the Olympic road race fell victim to the strength of British cycling, with other riders unwilling to help the favourites chase down a breakaway. Storey's superiority over an admittedly smaller field meant she did not need to worry about a repeat. She leapt off the front off the pack after just five minutes of the 64km race and it was the last the competition saw of the Manchester rider. Storey had a lead of more than four minutes 51 seconds by halfway and, after waving to the partisan crowds all the way down the Brands Hatch home straight, rolled over the finishline in leisurely style. Poland's Harkowska, who was also second in the road time trial and individual pursuit, collected silver behind Storey for the third time at the Games. "You can never take anything for granted, there could be other riders or punctures, but I had to stay upright and make sure I finished," added Storey. "Sixty-four kilometres is never easy, whatever it looked like." Mark Colbourne, like Storey, was aiming for his fourth medal of London 2012, but came home 24th in the men's C1-3 road race with fellow Briton Shaun McKeown 21st. Britain's Jon-Allan Butterworth also failed in his hunt for a fourth medal. The 26-year-old Iraq veteran, who picked up three silver medals in the velodrome, dropped out of the C4-5 race as he struggled with injuries sustained in a previous training crash.